I shan’t enter a biography here, wikipedia has a far more comprehensive one than I can offer, simply a reflection on the effect the man’s work had on a young mind which had far too much on it, very little of it good. In 1990 I was more than a little mixed up; in fact, it’s fair to say I was a complete mess. I didn’t fit in very well at school, coming from an extremely poor family but living in the first generation of working class British children to whom appearances were the sole defining factor of social standing. An ill judged admission of something horrendous from my infancy to the wrong person led to being ostracised by my former friends away from school. The trouble at school, which of course led to chronic truancy, caused trouble at home. My parents were not only struggling financially, but my father was fighting to come to terms with being disabled at a very young age, so even the very slightest of transgressions from me resulted in terrifying rages and often disproportionate punishment. All of this, combined with a school who refused point blank to admit that any bullying could possibly be taking place there, added up to a depressed 11 year old who had nowhere, and no-one, to turn to. Like so many children in that position before me, I turned to books. I quickly burned through the small collection of paperbacks we kept in the house, so turned to the school library; a room I’d been in several times before, but never truly noticed until I was at my lowest ebb. I read volume after volume of ponderous, well meaning, but ultimately patronising, crap about kids who were going through similar things to me. I read a lot of very cosy sci-fi about middle class, popular lads with names like “Chad” and “Nathaniel” who got wrapped up in some mystery or other which always ended up being about a crashed spacecraft or a time traveller. I read the books, but none of it really sunk in. I wanted neither “someone like me”, nor a “role model” to aspire to. What I wanted was something I only know in hindsight. One fateful afternoon during that one day a fortnight when a teacher could be bothered to unlock the library and let whoever wanted one borrow a book, I saw something unusual, something with a cover like nothing I’d previously seen on the school shelves, although it must have been there all along as it was fearsomely battered and dog-eared; I saw a faintly washed out image of a cart full of rats, careening down a country lane with one rather scary looking rat at the front of the cart, wearing the skull of another animal and carrying an enormous spear, while flames tore at the very cart he rode on. Captivating image, isn’t it? The blurb on the back intrigued me even further, so I took the book home. I don’t think I so much read the story, as inhaled it directly from the page. I remember reading it at least four times during the period I had it on loan, then borrowed it again so I could read it some more. It spoke to me on a level far deeper than all of those oh-so-condescending, touchy-feely, it’s-ok-to-have-issues, worthier-than-thou novels combined. Not because any of the characters were monochrome reflections of what the writer thought I must be going through and not because any of the situations mirrored the things going on in my life. The book gave me something far more important than that; it gave me an escape from all of that rubbish. It gave me a window on a world where good and evil were clearly delineated. There’s no way to underestimate how vital that was to me at that point in my young life. Over the next few years, as a troubled childhood became a disturbed adolescence and my grip on what constituted being happy gradually eroded due to the tremendous weight of pressure I was under, the tales of Redwall Abbey, Loamhedge, Salamandastron and the good creatures who lived there were my life preserver, the things that gave me release and something to cling to in times of trouble, which unfortunately were almost never ending during my teens. No matter how rough things got, the anger of my father, the disappointment of my mother, the bullying from the other children or the complete indifference of my teachers to my problems, no matter how much I tried to impress on them how seriously I was struggling to cope with what was happening, I could disappear into a Redwall novel and for that brief period, all was calm, all was well and I could drown out the welter of emotions I was too young and inexperienced to process. In short, at a time when I could have either gone off the rails entirely, or else stark staring mad through the storm raging inside me, Brian Jacques gave that storm a calm and soothing eye. 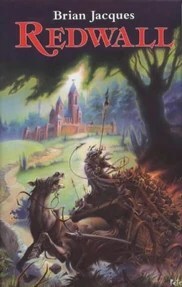 Eventually, I grew out of the Redwall novels. There came a time when I didn’t need them any more, when that calm, soothing voice was no longer needed. I had become an adult, at last, and the books both read and felt childish to me, a relic of a time when I read only for comfort and escape. When that day came, I placed all of the books in a bag and bade them fond farewell. They didn’t go to a charity shop, or to a jumble sale. After all they’d done for me, they deserved far better than that. They went to my niece, a charming and intelligent girl who I hope can read the stories for their excitement, adventure, good humour and good nature. I only hope she enjoys them as much as I did, without needing to cling to them quite so hard or for the same reasons. Rest in peace, Mr Jacques. The man I am held you in high regard and the boy I was owes you far more than I can adequately express.